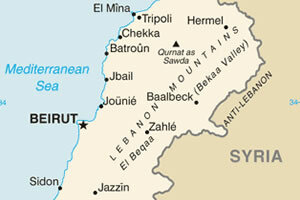 Lebanon is located in the East Mediterranean and is bordered by Syria to the north and east and Israel to the south. Lebanon's location at the crossroads of the Mediterranean basin and the Arabian hinterland has dictated its rich history and shaped a cultural identity of religious and ethnic diversity. The country is divided into four distinct regions: the coastal plain, the Lebanon mountain range, the Beqaa valley and the Eastern Lebanon Mountain range. A full-scale civil war broke out in Lebanon during 1975 as a result of sectarian tensions and sixteen years later, the war ended in 1990. In addition to massive loss of human life and property, some 900,000 people, representing one-fifth of the pre-war population, were displaced from their homes. More recently, the onset of civil war in Syria which intensified during 2012, is causing a humanitarian crisis in Lebanon as the country’s severely strained resources struggle to cope with an influx of Syrian refugees. Lebanon currently accommodates some 350,000 refugees as well as large numbers of Syrians who left Syria prior to the escalating violence. Lebanon also hosts large numbers of displaced Palestinian people. World Vision has been active in Lebanon since 1975 when it began to provide shelter, food, and medicine for people affected by civil and regional conflicts. In the 1980s, World Vision Lebanon (WVL) initiated its development work among various communities and denominations, mainly through institutional projects and small grants. More recently, the 1990s saw the introduction of Area Development Programmes (ADPs), with a comprehensive and integrated approach to sustainable community development. 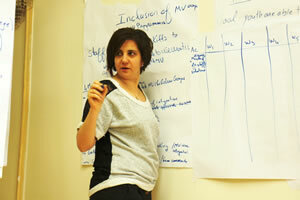 ADPs are planned, designed, and executed in partnership with the communities that WVL serves. WVL is especially keen to recognize the outcomes of an array of projects that are led by its community volunteers and so in March 2013, GULL pilot work began with WVL volunteers and staff. (Above right) The WVL with GULL lead group pictured during the pilot briefing session. 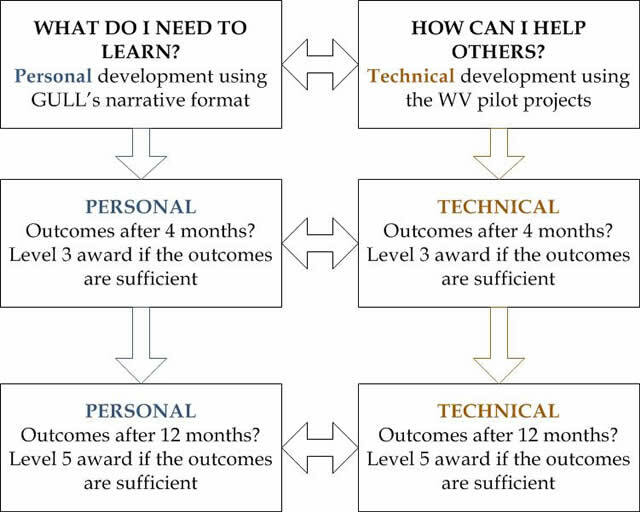 GULL’s approach to systemized community and work-related development aims to foster a parallel process of personal development coupled with technical development (as depicted below). 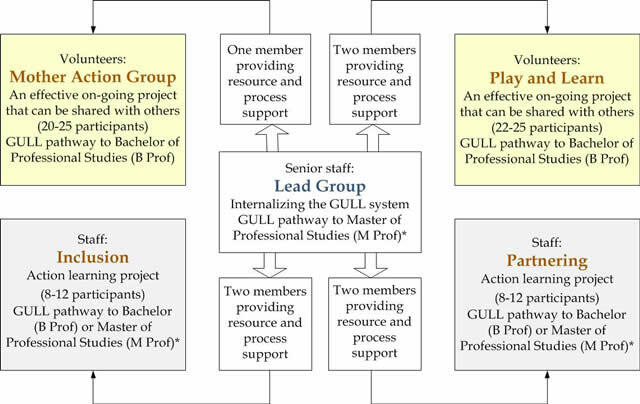 GULL’s generic approach to personal development begins as participants determine what they uniquely need to learn for themselves while they help others by implementing WVL projects. 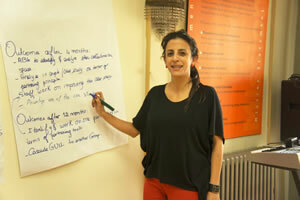 (Left) Rita, a WVL Education & Life Skills Specialist and GULL participant at the GULL pilot briefing, 11-14 March 2013 at the WVL National Office in Beirut. (Above) A lead group will facilitate the WVL with GULL via four projects. *M Prof entry is determined by seniority, maturity and experience as they must demonstrate a strategic contribution in order to attain their award. Objective: Participants will be able to develop and implement small creative projects as a service to the community and as a vehicle for personal and professional growth. After 4 months (Level 3): Participants are able to design, implement and critically review a small creative project and present their findings at a workshop prior to the level 3 award. Design, implement and critically review a second creative project in collaboration with other villages. Gather the learning outcomes from their creative projects and confidently share their experiences, future plans and other potential applications with others (including WV staff, family and friends and the media) at the graduation marketplace event. (Above right) Leon, WVL Operations Director pictured with Norma, WVL’s Change Management Lead at the GULL briefing, 11-14 March 2013. Objective: Participants will be able to contextualize and use flexible approaches to working with and integrating the new most vulnerable groups with WVL programming. Analyze (using all the available tools) and update the MV groups based on vulnerability factors. Plan how to integrate and approach new MV groups. Use the GULL system and share the approach with others at work. Present a progress report at a workshop prior to the level 3 award. Gather evidence that the integrating plans are being implemented and are working and are able to deploy corrective action as needed. Gather the learning outcomes from the planning and implementation process and present them to a public audience (other participants, WV staff, invited guests and the media) at the graduation marketplace event. (Above right) WVL with GULL pilot planning group at the conclusion of the GULL briefing, Thursday 14 March, 2013. 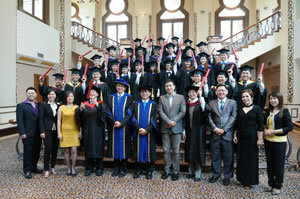 The Annual Malaysian graduation ceremony took place on Sunday 28 April in the Stateroom, Palace of the Golden Horses, Mines Resort City, Selangor, Kuala Lumpur. During the past 12 months, more than 100 people have successfully completed GULL pathways in Kuala Lumpur and significant expansion is occurring throughout the region. Dato’ Dr Vincent Tang has led GULL’s development in South East Asia for the past three years and most recently facilitated GULL’s successful launch in China. 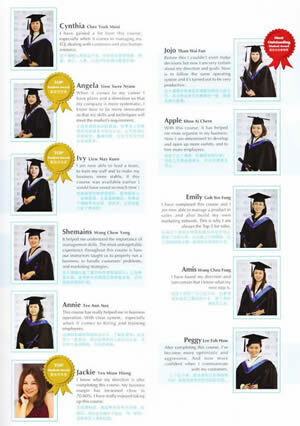 Vincent is supported by a team of honorary officers and the guest of honour at the 2013 graduation was Chan Fong, GULL Ambassador for Malaysia. Chan Fong began his acting and media career in 1991 and soon became a popular radio personality. In 1997, he won the best Chinese DJ award and in 2004 he was voted one of Malaysia's ten most popular artists. 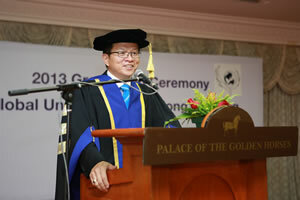 He has hosted many radio and TV programmes in Malaysia and acted in TV dramas for the Astro, TV3, NTV 7 channels. 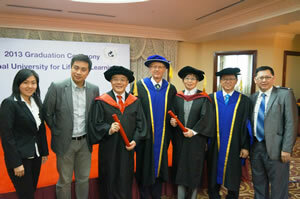 CNH Land, a leading real estate organization in South East Asia, launched its own CNH Academy in affiliation with GULL on Thursday 19 April 2012. CNH has an extensive network of representatives in SE Asia, particularly in Malaysia and China. 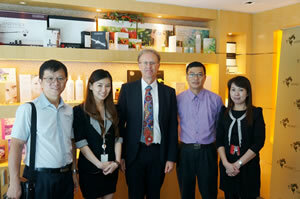 The high profile launch event was attended by a Government Minister. The CNH Academy with GULL offers a Bachelor of Professional Studies (Real Estate) degree that meets all the technical and professional requirements needed to qualify as a real estate negotiator. This initiative is the first of its kind in Malaysia and it has been well received by industry and the initial cohort of participants. GULL’s new South East Asia regional office occupies 1,700 square feet of space in a city centre location opposite Tasek Permaisuri Park. Thanks to Vincent and Jan, the offices are beautifully decorated, furnished and equipped to support expansion throughout the region. 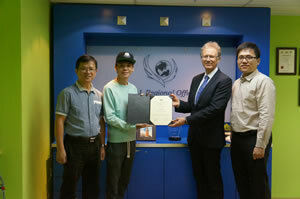 GULL aims to provide opportunities for marginalized young adults around the world and we were delighted when Wan Lau Min (Danny) accepted our invitation to become a GULL Ambassador for Malaysia. Danny is a critically acclaimed musician and singer who uses TV, radio and live performances to encourage and energize young people. 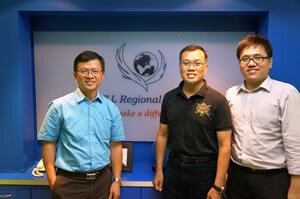 (Above right) Vincent Tang (left) and Keith Ngai Ji Seng, GULL leader, Malaysia (right) welcome Ernest Wong, Founder, Learning Mastery Pte Ltd (centre) to the new regional office. Arising from the success of its GULL professional Bachelor degree (Beauty & Spa) during the past year, the Celmonze Aesthetic Academy with GULL launched Malaysia’s first Master of Professional Studies degree for the industry on 2 May. The launch of Malaysia’s first professional Master degree for Beauty and Spa professionals took place at the Celmonze Aesthetic Academy on Thursday 2 May. The affiliation with GULL had enabled Celmonze to implement a highly regarded professional Bachelor degree and a number of graduates and other industry professionals have already registered for the Master degree pathway. 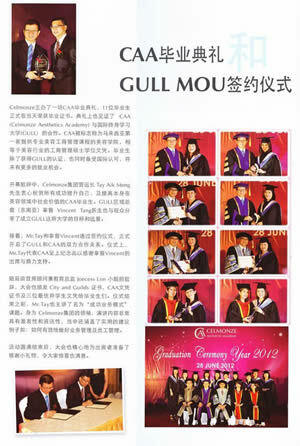 Master degree student Jackie Yeo comments: ‘I now know what my future direction is after completing my initial studies with GULL. It has helped me to increase my business margin by 70- 80%’ Given these outcomes, Jackie is keen to continue her action learning journey with GULL. 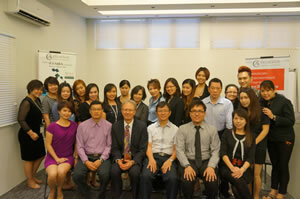 (Above right) Celmonze Academy staff and students at the professional Master degree launch meeting. Science of Life Systems (SOLS) 24/7 offers a development route for disadvantaged youth from poor communities in six South East Asia countries via its two-year training and boarding programme. Established in 2000, SOLS has worked with many thousands of young adults and via its recent affiliation with GULL, is now able to provide pathways to recognized professional qualifications for its students. 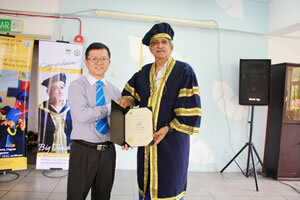 On 14 May 2013, Madenjit Singh - the founder and driving force of SOLS 24/7 – was awarded GULL’s honorary Doctor of Professional Studies degree in recognition of his lifelong learning and service to the community. (Above right) SOLS with GULL congratulates Dr Singh, who is affectionately known as the ‘Big Teacher’.